Proven basement waterproofing systems and patented, engineer-certified wall straightening products. Family-owned since 1967. Gorilla Wall Braces® – Patented & Engineer-Stamped! Gorilla Wall Braces® have been put through pressure and stress tests by a Professional Engineer – earning a Professional Engineer Stamp that they are safe and effective to fix bowing basement walls. The Gorilla Wall Braces® system has been engineered to exert force evenly along the wall to eliminate wall shear. Steel beams are attached to the concrete basement floor and the wooden joists above with the Gorilla Wall Braces® system to stop a buckling wall from moving further inward and to prevent further movement. 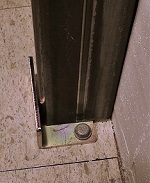 The engineered floor bracket of the Gorilla Wall Brace® system requires no removal of the concrete floor. The Gorilla Wall Brace® patented design utilizes three floor joists to distribute the wall load more evenly and to give it more pushing strength. The Gorilla Wall Braces® are continually tightened to push the bulging basement walls back to plumb over time – or with slight excavation done on the outside, the Gorilla Wall Braces® system can straighten basement walls in one day. *The steel wall beams for the Gorilla Wall Braces® system are purchased separately at your local steel yard as they are too cost prohibitive to ship. NOTE: If you have an extreme case where the floor joists are rotten, insect or bug eaten or very soft wood, do not order this system to straighten your pushing walls. Use our Hold-Right® Wall Anchor System instead. Unique in the industry, the Perpendicular Gorilla Wall Braces® utilize the support of three floor joists. This allows the Perpendicular Gorilla Wall Brace® to push off of three floor joists to increasing the pushing strength over other systems on the market that push off of only one floor joist. By utilizing three floor joists, the Perpendicular Gorilla Wall Braces® are able to distribute the wall loads more evenly to the joists. This reduces the side pressure which prevents the wood floor joists from twisting or buckling as with other basement wall straightening systems pushing off only one floor joist. The Parallel Gorilla Wall Braces® are secured in a similar fashion to evenly distribute wall loads over multiple floor joists and to give it more pushing power. Gorilla Wall Braces® are a proven solution to straightening bowing walls and eliminates any further movement of basement walls pushing in. It gives homeowners peace of mind knowing their foundation walls are secure with a patented wall bracing system that is Professional Engineer-Stamped. It is the most effective and economical wall bracing system available in the market today! A Parallel Gorilla Wall Brace® is available for bowing basement walls that are parallel to the floor joists. 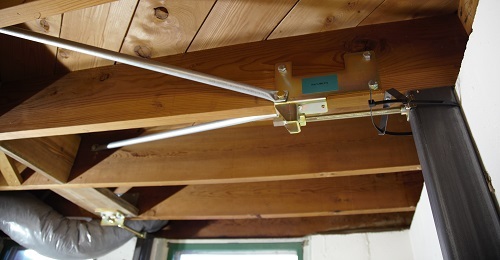 To straighten buckling basement walls that are perpendicular to the floor joists, a Perpendicular Gorilla Wall Brace® is used. Our patented Gorilla Wall Braces® will stop either bulging wall from moving inward any further. Professional Engineer-Stamped Gorilla Wall Braces® also have the ability to move bowed foundation walls back into place the same day when the wall is excavated. To move the wall the same day or for severely bowed basement walls, the wall needs to be excavated next to the foundation on the outside to alleviate soil pressure on the foundation wall. The Gorilla Wall Braces® can then be tightened to apply pressure on the wall until they push the bowed wall back into place. Most jobs only take one day to complete. 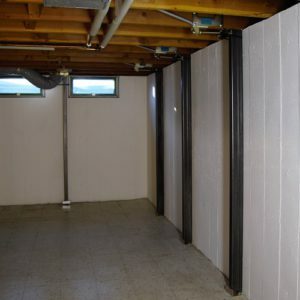 Straighten bowing basement walls without excavation! Professional Engineer-Stamped Gorilla Wall Braces® can also straighten most walls over time with no excavation to the exterior of the home. A constant pressure can be kept on the bracket by regularly tightening the screw at the top of each Gorilla Wall Brace®. This pressure will slowly move the beam to plumb. As the beam moves, the basement wall will also move back to its original position, straightening the basement wall without any exterior excavation. Our innovative floor bracket allows for the installation of Gorilla Wall Braces® without removal of the homeowner’s concrete floor. 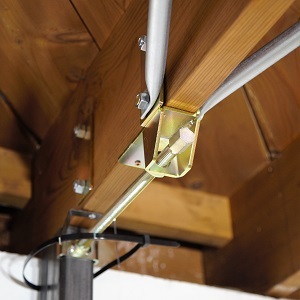 Gorilla Wall Braces® can also be used in basements without a wood floor joist ceiling. Many newer houses with bowing walls have ceilings of 16-24 inch I-Joists made with 2 inch x 4 inch bridging, and steel bridging, while others are made with plywood. 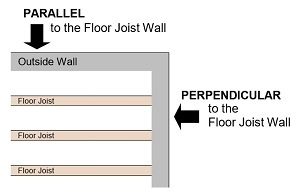 Gorilla Wall Braces® can be attached to the modern “I floor joist” in these newer homes with only minor modifications. Gorilla® Wall Braces® can also be installed where there are no floor joists, such as basements that are constructed with spancrete at the ceiling. Resch Enterprises has an exclusive pushing bracket that can be attached to the spancrete. A Gorilla Wall Braces® system should not be used in areas such as stairways, wood basement walls, cupboard areas, hot water heat registers along the wall, and a walk out basement opposite wall. In these areas or circumstances we recommend using our Hold-Right® Wall Anchor System that uses an earth anchor placed in the ground approximately 10 feet from the building to pull the bowing wall straight again. Gorilla Wall Braces® are available to homeowners if there is not a Resch Enterprises Contractor in your area. *NOTE: The steel wall beam for the Gorilla Wall Braces® is purchased separately at your local steel yard as it is too cost prohibitive to ship.